Craig and I were married on August 1, 1970. On our wedding day, he gave me a beautiful strand of matched cultured pearls. It was by far the most valuable jewelry I had ever owned. On our first anniversary, Craig surprised me with matching pearl earrings. I was overcome by his thoughtfulness and I treasured them. I kept my pearls in a little velour bag and took them out for special occasions. When I received the earrings, I put them in the bag with the necklace. But later, because I wore them more often, I began putting the pearl earrings in a case with my other earrings. Years later, I purchased a strand of fake pearls that I felt comfortable wearing more often. I kept the fake pearls in another velour bag in my jewelry case. The fake ones were very nice and looked genuine, but I was always able to tell them apart from my real ones. On a day in 1985, I wore my pearl earrings to work as I often did as a teacher at Bradshaw Mountain High School. In the afternoon, when I was preparing to go home, I noticed that one of my earrings was missing. Needless to say, I was devastated. I had lost something of great value–not just because they were real pearls, but because of their importance to me as a gift from my husband. I looked for that earring nearly every day I walked the campus or spent time in my classroom, but I was never able to find it. A few years later, our high school was moved to a new campus and I had to give up the search for my earring. Twenty-five years later, I was organizing my jewelry. I removed the strand of pearls from the bag and there was the single earring I had placed in the bag after losing its mate. 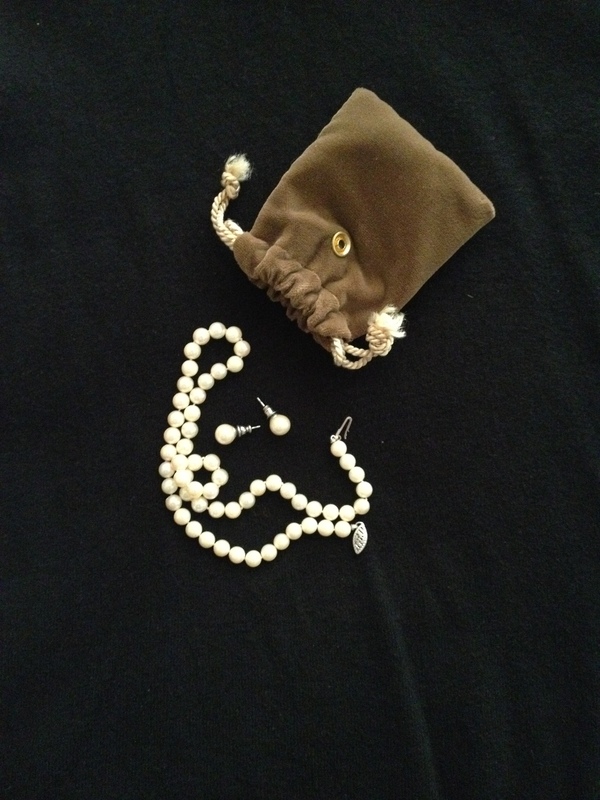 I removed the strand of fake pearls from the second bag and out came a single earring. I figured that I had put the earring in the wrong bag, so I placed it in the bag with the real pearls. A few months later, I planned to wear my pearls. I dumped them out on the bed. Along with the strand of pearls, came two perfectly matched pearl earrings. How many times over the course of twenty-five years had I taken those pearls out of their bag? How many times had I looked at that lone earring with a feeling of sadness? Yet here were both earrings. How could that be? Of course, there are logical explanations. Maybe I only put one earring in that morning. Maybe there had always been one earring in each bag. Maybe I had just overlooked it for twenty-five years. As someone who believes in miracles, I tend to have as much faith in the improbable as the probable. And so I choose to believe that this treasure of my heart was returned to me as a gift of love.